kiele: guess who's older. mommy or daddy? skyler: mommy is older b/c she has way more wrinkles. ryder: what's wrinkles? skyler: they're the lines that go down her face. kiele: they're saggy skin, like a bulldog has. ryder: oh, i get it now. me: i don't have that many more wrinkles than daddy. skyler: yes, you do. the things that they sometimes say...oh. my. gosh! and that skyler, she makes me laugh like no other, which i'm so thankful for. i've been having a tough few days. stressed about this and that. short with my kids. i'm allowed to, right? i think it's all just getting to me. and i'm damn ready for my husband to be back home now. steve would tell me not to worry and stress about all this stuff (if it gets done, it does and if not, that's okay too) and i'm sure he'll be saying exactly that, once he reads my blog, but...when steve gets back, we'll only have about a month before we move. i don't want our month to be consumed by all the above crap and moving is just plain stressful as it is. i want to enjoy my husband's arrival back home. i want to do nothing except spend time and enjoy one another as a family--a complete family. and to be completely honest, there will be an adjustment period when steve gets home. and i don't want to make this time--this time of adjustment and reintegration of the deployed person-- any more challenging by worrying about finding a rental, selling cars, etc. while a military homecoming seems all grand and joyful, the weeks after a homecoming are not as easy as it sounds. sure, initially, it's absolutely amazing but then there's the adjustment and that, my friends, can be a bit difficult, as any military spouse will tell you. 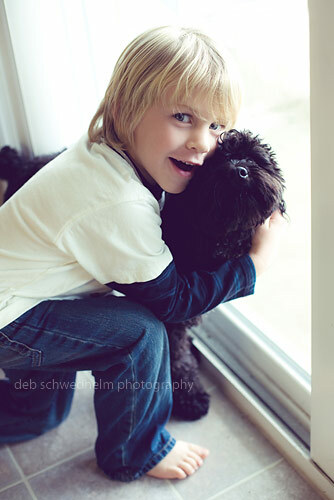 in closing, i leave you with a photo of ryder and our one dog, charley.